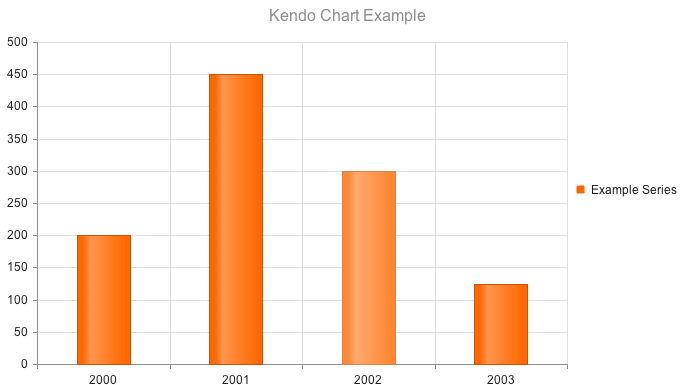 The Kendo UI Charts use modern browser technologies to render high-quality data visualizations. All graphics are rendered on the client using Scalable Vector Graphics (SVG) with a fallback to Canvas. For additional information on new Kendo UI Chart types and features, refer to the Kendo UI Roadmap. To create a chart, add an empty div in the HTML, provide it with an ID, and, optionally, set the width and height of the desired chart inline or via CSS, as demonstrated in the example below. 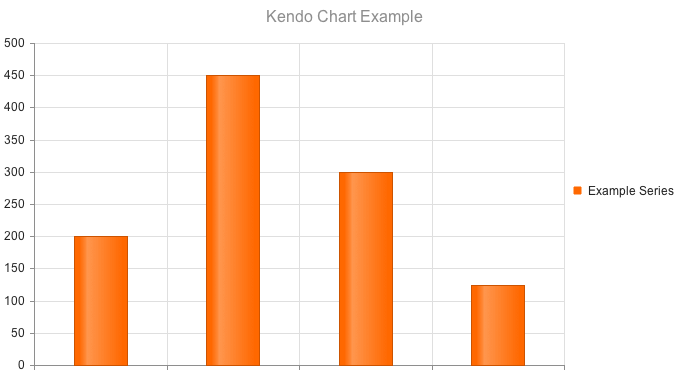 The Kendo UI Chart widget is rendered by selecting the div with a jQuery selector and calling the kendoChart() function, as demonstrated below. This results in the chart below. This chart can be given a title by specifying the text property of the title object, as demonstrated in the example below. 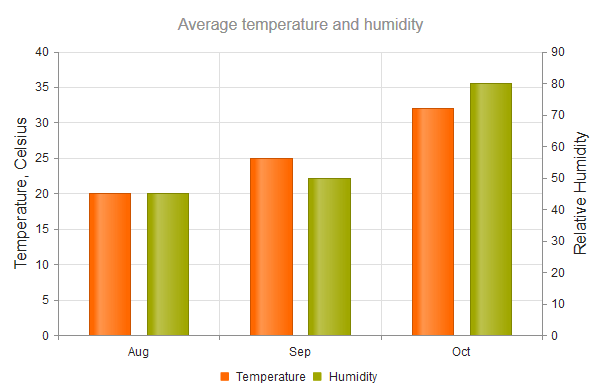 Kendo UI Charts can visualize series bound to both local and remote data. Start by creating a series that displays inline data. Notice that the columns have no label across the category axis. Specify the labeling for the series in the categoryAxis property, as demonstrated in the example below. Categorical charts, such as Kendo UI Bar, Column, and Line Charts, use one category axis and one value axis. The axis orientation (horizontal or vertical) is inferred from the series type. Use the categoryAxis object to set the category names, as demonstrated in the example below. The category name can also be bound to a field of the data item, as demonstrated below. The category and value axes provide options for displaying their labels either next to the axis or at the outer edges of the plot area. By default, the labels are positioned next to the axis. (Default) When position is set to "onAxis" or undefined, the labels are positioned next to the axis. When position is set to "end", the labels are placed at the end of the crossing axis. Typically, this configuration positions the labels at the top or right end of the Chart unless the crossing axis was reversed. When position is set to "start", the labels are placed at the start of the crossing axis. Typically, this configuration positions the labels at the left or bottom end of the Chart unless the crossing axis was reversed. 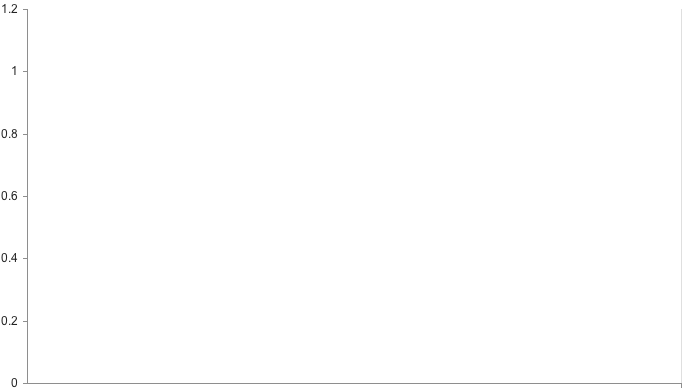 The Kendo UI Chart currently supports only Numeric value axes. Configuration options are accessible through the valueAxis object. The example below demonstrates how to configure a Numeric axis with a minimum value of 0 and a maximum value of 100. A Kendo UI Chart might have more than one value axis. These additional axes must have unique names. 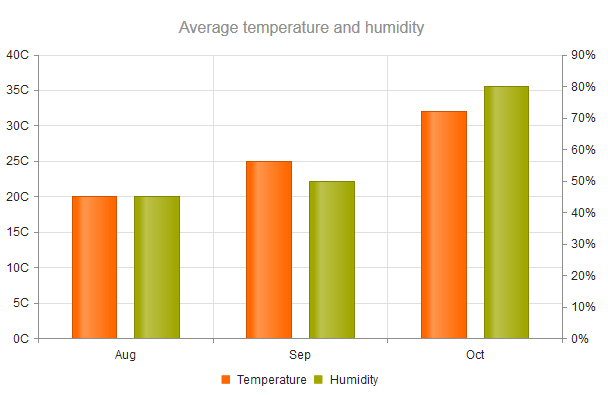 The example below demonstrates how to define the temperature and humidity axes. Series are associated to a value axis by specifying its name. 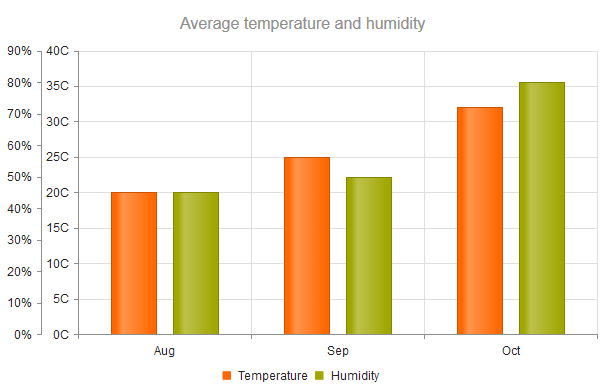 text: "Average temperature and humidity"
You are able to control the arrangement of the value axes by specifying the values (category indices) at which they cross the category axis, as demonstrated below. The first value axis crosses the category axis at the first category (leftmost). The second value axis crosses it at the last category. XY Kendo UI Charts, such as Scatter and Scatter Line ones, use one or more X and Y axes. These axes are configured through the xAxis and the yAxis objects, as demonstrated in the example below. The X and Y axes provide options for displaying their labels either next to the axis or at the outer edges of the plot area. By default, the labels are positioned next to the axis. You are also able to define more X and Y axes in addition to the primary axes, as demonstrated in the example below. These additional axes must have unique names. Series are associated to a X and Y axes by specifying their name. Do not specify a name for the primary X and Y axes. The first series is associated with the default Y axis, as no axis name is specified. 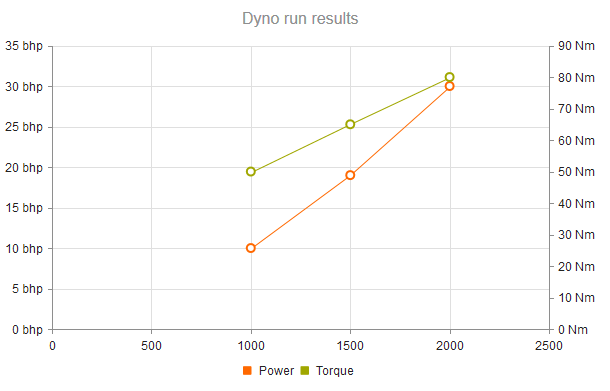 The torque series are plotted on the torque Y axis. You are able to control the arrangement of the X and Y axes by specifying the values at which they cross the primary axes. The primary Y axis crosses the X axis at 0 (leftmost). 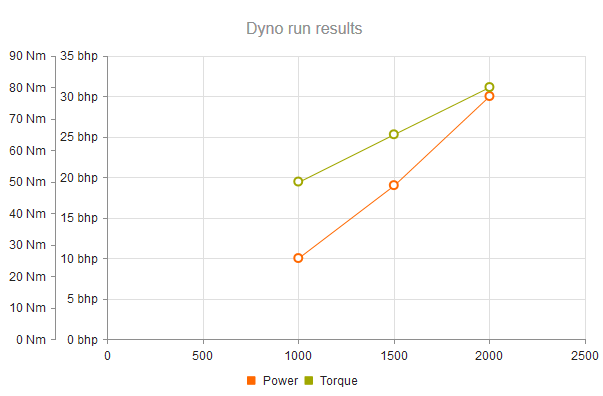 The second, torque Y axis crosses the X axis at the 2500 mark or at its right end, whichever comes first. You can add a title to clearly indicate the role of the axis, as demonstrated below. Each axis can be configured to display bands with different colors for predefined value ranges. The category index (zero based) is used as a value for the category axis. Sometimes you need to apply settings to all axes. In such cases it is convenient to use the axisDefaults object.